More than just an Assistant Principal! A Tiny Tiger becomes a television star! 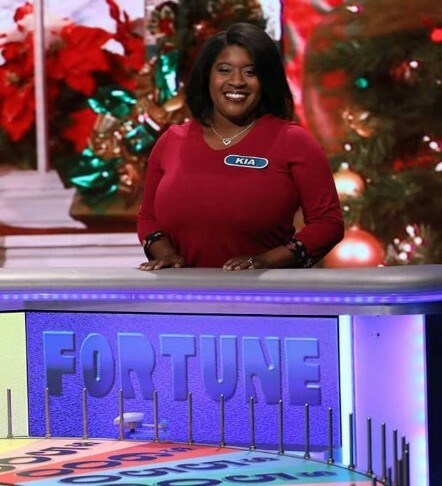 Mrs. Kia McAdams isn't your ordinary Assistant Principal, she's also now considered a game show contestant veteran on the nationally syndicated show, Wheel of Fortune! In October of 2018, Mrs. McAdams and her husband, traveled to California to record the show, which aired on Monday, December 17, 2018. Defeating two other contestants, she advanced to the final puzzle and had an opportunity to win $1,000,000.00- to find out how she did, you can watch the episode with excitement and anticipation, just like every Tiny Tiger had to! Her journey to get on the show began in the Spring of 2017, before she was ever even hired to work here at Erma Nash Elementary, on a family outing to Nebraska Furniture Mart, with her husband and then toddler, and three-week old baby in tow. Mrs. McAdams stated that the Wheel Mobile was present, she gave it a spun, as did hundreds of other people that wanted to enter, and then she was later called on stage, where she and her newborn baby got to go on, while she was asked questions and such. It then became a waiting game to see when she would record the show and when it would air, so fast forward to now, she's now our Assistant Principal, and we couldn't be more proud of and thrilled for her!!! Way to go Tiny Tiger, Mrs. McAdams! When asked about her experience, Mrs. McAdams stated: "It was lots of fun and anybody who thinks they may want to, or are interested, should try! It was that much fun!"